Carpenter, Painter, Driver and various Posts. Only Indian Nationals are allowed to apply for these IAF HQ Bangalore posts. 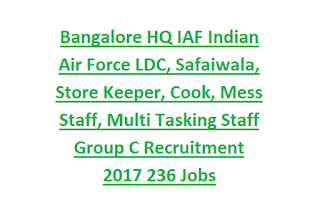 There are total 122 Group C vacancies available in this recruitment of IAF Bangalore HQ Training Command. If you are interested in this IAF Civilian posts recruitment then you can apply in a prescribed format within 30 days from the notification given in employment news. Probable last date to reach the application to IAF is 28-12-2017. Selection for this Indian Air Force Group C vacancies will be held through Written test, Skill Test and Trade Test. For complete details regarding Indian Air Force Recruitment of Group C LDC, MTS, Cook, Safaiwala and other posts details are given below. Download official notification for IAF Group C Multi Tasking Staff posts. Reaching applications to IAF HQ Training Command Bangalore is 30 days from the notification given date. Post Name and available vacancies details are given below. For all the posts 10th class (Matriculation) qualification is compulsory. For trade related jobs must have completed ITI in their respective trade. For LDC-Lower Division Clerk post the candidate must have qualified 12th class and should have typing skills on computer with 30 wpm in Hindi or 35 wpm in English. For Storekeeper, Stenographer and Hindi Typist jobs 12th pass is required. For Hindi Typist 30 wpm on computer and 25 wpm on Type Writer. For Lab Assistant B.Sc qualification is required. For more details please see official notification. 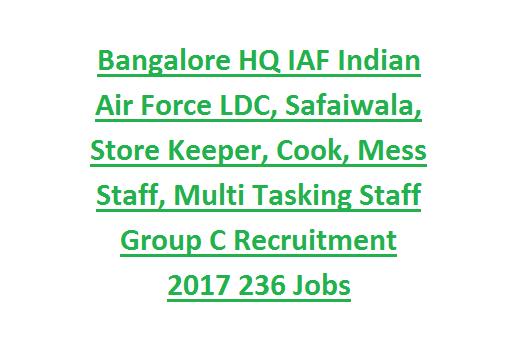 IAF Group C vacancies of HQ Training Command Bangalore will be through Written Test/Physical Test/Skill Test/Trade Test. Written test syllabus will be in Matriculation standard only. Interested candidates can send their application form in a prescribed format to Indian Air Force, Head Quarters Training Command, Bangalore. Attach all required documents and self addressed cover with Rs.5 stamps and write on application cover letter "Application for the Post of ________________and Category of _______".